Union St. between 4th & 5th Ave.
April through October: weather and volunteers permitting! We practice organic gardening: the garden does not use artificial fertilizers, chemical pesticides or genetically modified seeds. Members plan and work collaboratively and individually. There are a variety of ways you can help. We ask that if you harvest from the Garden you give your time and energy back to the Garden. We are a community based organic garden. Activities and services for the public including school tours, garden mentoring and compost education are offered by volunteers. Anyone can become a member and non-members are welcome to visit and tour the garden during open hours and whenever the gate is open. If you would like to participate in any way, we welcome you year-round. You can join the Garden at any time by mailing the form in the brochure along with a check for membership dues to our treasurer or by bringing the paper form to a monthly business meeting. The Garden of Union uses the money to pay for seeds, supplies, fencing and other expenses. Rather than assigning individual plots, garden beds and areas are overseen by stewards who coordinate communal planning and care of the space. After joining the Garden, please contact us. Though it varies by year and steward, the beds on the inside of the Garden are generally reserved for annuals – with some exceptions – and the perimeter area of the garden is mostly planted with perennials. Changes to the garden often occur slowly, over time. Stewards take greater responsibilities for integrating new members, planning the garden, and tending to garden business. Stewardship positions are open to everyone, and applications are available in the fall. Application for membership constitutes an agreement to follow the rules of the Garden and to direct guests and visitors to follow these rules. The member orientation page contains more information about the Gardens’ rules. The Garden of Union has open board meetings on the third Tuesday of each month at 7PM. They usually take place at Ozzie’s Coffee Shop, 249 5th Avenue in Park Slope. Please check ahead to confirm. You can attend meetings or submit your ideas in writing for discussion in the meeting. Our meetings are organized around principles of consensus and we make every effort to be sure that all voices are heard. Respect for others is required. Check out our events calendar for more information. Compost helps to keep our garden organic by providing structural improvement of the soil and preventing the need for artificial fertilizers. 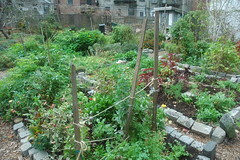 The garden composts its waste and accepts material from neighbors and from the Park Slope Food Coop. Compost contributions are encouraged and appreciated and we ask contributors to follow a few simple guidelines. The compost deposits rotate between bins, and the bin that is currently in use will be written on the chalkboard outside the tool shed. Please only deposit compost in the bin designated for compost at that time. If you want to learn more about compost, please contact us for a quick question, a tour, or training. Compost contributions do not entitle members to harvest from the garden. Please do not pass the combination along to friends or roommates. Read more about additional information and guidelines about composting in the Gardens of Union. Anytime you unlock the gate to the Garden, be sure to secure the lock back onto the gate to ensure that it is not stolen, lost or damaged. The Parks Department requires that we open the gate when members are in the garden. Lock it when you leave, even if you are near-by. If you plan an activity in the Garden, please contact us. This includes school tours and parties. Everyone is invited to all events held in the Garden. Children and guests may need help following the general garden rules. Children are not allowed to use the hose or faucet, climb the trees, step in the beds or race on the paths. We practice water and soil conservation. Dogs are welcome if they are well behaved and leashed. Do not allow your dog to pee or poop in the garden, eat plants, dig, or swim in the pond. Visitors are responsible for their own safety. The Park Slope CSA distributes its produce at the Garden of Union, mid-June through mid-November on Thursdays from 4PM– 8PM. The CSA is an open group of pre-paid members who receive a weekly box of organically raised vegetables and other items. For approximately half the year, food is delivered from upstate and in 2006 there were over 100 members. Food stamps are accepted. For more information on the CSA, visit www.parkslopecsa.org or contact us. The Gardens of Union supports the practice of eating locally grown food. We encourage members to be present during the CSA hours of operation.